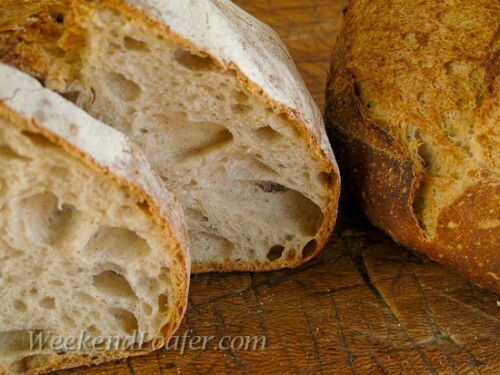 Pain de campagne, or “country bread”, is rustic bread baked throughout all regions of French. There really is no one correct way to make a Pain de campagne loaf; the formulas are as varied as are the traditions of shaping the loaves. 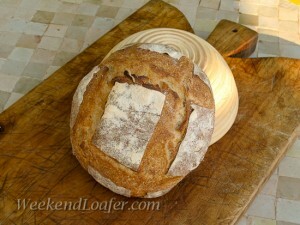 Pain de campagne can be made with a natural leaven or with baker’s yeast. 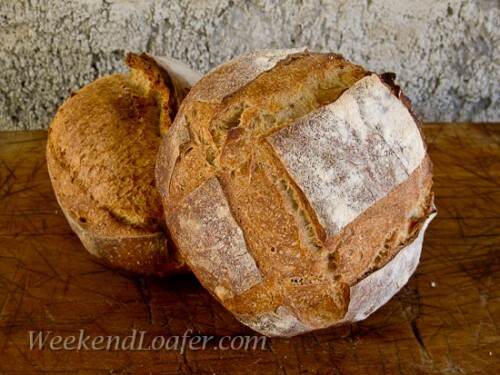 Some prefer to add a small percentage of rye flour to their dough while others prefer whole wheat. Throughout France, whether it is in the busy cities or the pastoral countryside you’ll find Pain de campagne in almost any boulangerie you visit. Each baker has his secret recipe and shaping technique that he has developed according the regional tastes. When in Nice the boulangerie I frequent makes his country bread with a levain naturel in both a boule and batard shape…the baker in the small town closest to me makes his in a batard and boule shape with a fendu (split) instead the traditional scoring. The thick crusted, humble Pain de campagne from Daniel Leader’s Local Breads is perfect in every way…the dough is a pleasure to work with and displays a remarkable oven spring, the crumb has a full bodied deep flavor from the small amounts of rye and wheat…what else could you ask for? I was recently asked by a good friend who has been hit by the bread bug “How do you keep your dough at a consistent 76°?” So I thought I would share the method I came up with to keep the levain or dough at any constant temperature you desire. When living in the United States in the Northeast the winter temperatures in my house would hover around 62-65° (by choice) and now, in France living in a stone cottage(a cave) with 24inch stone walls it stay cool most of the year hovering around 52-68° . You could always fall back on the old pot holder trick (3 folded pot holders=76°) in the oven door with the light on, it works in a pinch but, you always have to check to see if it is right. 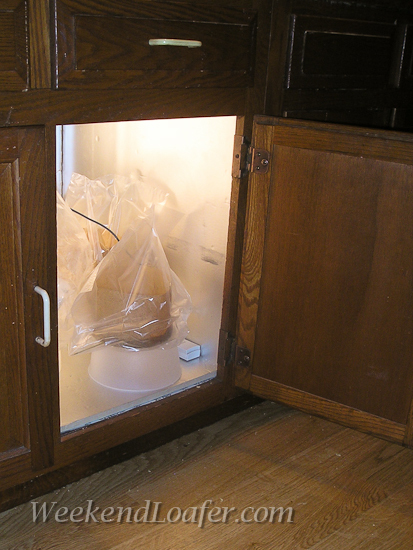 I came up with many ideas on how to make a proofer work… a plug-in car refrigerator/food warmer, a wine vault for the summer heat and a heater/light bulb for the winter. I turned to the internet and found a design for a proofer that Steve@Bread cetera posted @Fresh Loaf and I took it a step further. I went looking for a thermostat for reptile cages…. and ended up with a perfect alternative…a RancoETC microprocessor temperature controller thermostat that plugs into a heating unit(light bulb) or refrigeration system(for retarding). It really takes the prize and I got it for a good price on Craig’s List from a home beer brewer who started making babies and then his wife made him stop making suds. After fooling around with microprocessor…I have found… I can control the internal temperature of the dough within a degree of where I want it to be. All you have to do is; set the temperature, insert it into the dough and forget it. For the proofer box in the states I got a sheet of insulation board (blue board) from Home Depot and cut it to fit in my pantry. The heat source is a 75 w light bulb. 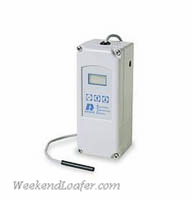 I also have an indoor outdoor thermometer I had laying around that sound an alarm if it goes past a set temperature…just as a fail-safe.My original intention was to get a small refrigerator or wine vault so I could bake all summer without a problem or use it as a retarder. 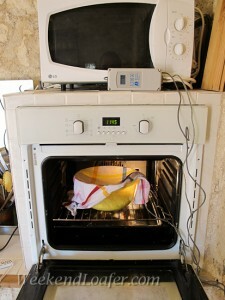 The proofing system I use now in France is just the oven…or microwave with the controller. The microprocessor has become one of the most valuable baking tools I have…if I had to make a choice between an electric mixer and the microprocessor…I would choose the microprocessor! If you have a question or comment…please enter below…or e-mail me. Take your levain out of the refrigerator, weigh out the appropriate amount of starter and whisk the levain in a bowl with the water. Add the flour and whisk until it smooth. Place the levain in a covered container and let it sit at room temperature (70 to 76°) for 8-12 hours or until it till it has expanded by about one third and the surface is bubbly. Kneading By hand: Turn the dough out onto your work surface. With floured or oiled hands knead a few strokes to start developing the dough, flatten out the dough, evenly disperse the salt and continue kneading for 12 to 15 minutes. I use a combination of the French kneading technique and the method described here if the dough is really wet to start. For the first couple of minutes it will be a sticky mess on your work surface, but do not yield to the temptation of adding more flour. Stop occasionally and use your bench scraper to gather any stray dough from your work surface. Continue until you have a good gluten development. You should be able to gently stretch a piece of the dough into a thin membrane that you can almost see through without it tearing. By machine: Add the salt and levain and mix on medium speed until the dough cleans up the bowl and you reach a good gluten development. Divide into two equal pieces and lightly pre-shape into a boule or a log shape. Lightly flour the dough, cover and let rest for 10-15 minutes. Shape each piece of dough into a batard about 12 inches long or a boule and place seam side up on a floured couche or into floured bannetons. Cover with a plastic bag or plastic wrap and proof at room temperature for 1-1 1/2 hours. (76°) When you press your floured finger into the dough, the indentation will spring back slowly. North West Sourdough…is a place to read about Teresa’s and other bakers experiences with sour dough, find recipes for baking real sourdough at home…and much more! Check it out…..